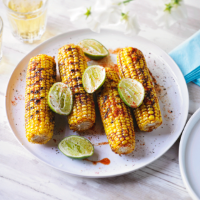 Rub the barbecued corn with lime wedges for a real zing; lime is also a fresh and healthy alternative to butter. Sweetcorn is high in fibre and vitamin C, and the dish is low-fat. 1. Preheat or light a barbecue (or place a griddle pan over a high heat). Remove the outer husk leaves so only 1 layer remains. Pull out the silk threads. Place the corn in a pan of boiling water for 5 minutes until tender. Drain well. 2. Peel back the husks, spray the corn lightly with oil, then rub with the spices. 3. Barbecue or griddle for 10 minutes, turning regularly, until tender and a little charred. Serve with lime wedges for rubbing over.